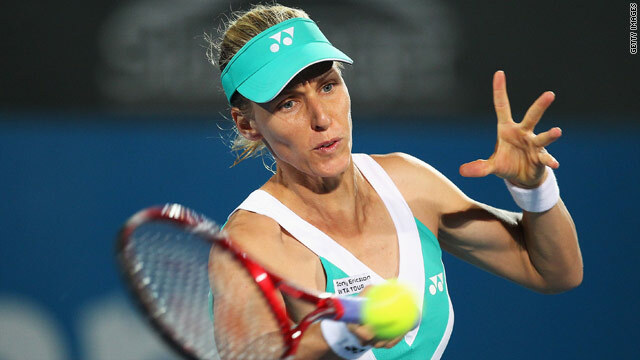 Elena Dementieva is through to the semifinals in Sydney after crushing fellow-Russian Dinara Safina. (CNN) -- Elena Dementieva remained on course to defend her Sydney International title with a convincing 6-2 6-3 win over world number two Dinara Safina in an all-Russian quarterfinal. In a night match delayed by rain, fifth seed Dementieva continued her dominance over Safina with wins in their last four encounters, including last year's Sydney final. Dementieva will now face sixth seed Victoria Azarenka of Belarus in Thursday's semis. "Dinara had a slow start, but I was ready for the game and ready for the fight," Dementieva told reporters. "She's a big girl, so she's a big hitter. You have to be ready for her to be very aggressive on the court. Sometimes you have to play defensive. " Earlier, world number one Serena Williams brushed aside Russian Vera Dushevina 6-2 6-2, making it just seven games she has dropped on her way to the last four of the Sydney tournament. You have to be ready for her to be very aggressive on the court. Sometimes you have to play defensive. Williams, strong favorite to lift her fifth Australian Open crown and her 12th Grand Slam, takes on world number 27 Aravane Rezai of France in the other semifinal. In the bottom half of the draw, Azarenka went through to the semifinals after beating Slovak Dominika Cibulkova 6-2 7-5. "I definitely enjoy playing in the heat," Williams said of Melbourne, home to the Australian Open. "I usually enjoy playing in the heat. I live in Florida, so it's all about hot weather there. I think maybe that's one of the reasons why I do so well down here."